Harlan J Berk, well known numismatist and author, whose enthusiasm for supporting educational projects knows no bounds, jumped right in to support an Ancient Coin Travelling Museum when Scott Uhrick of ACE first broached the idea. Ancient Coins for Education (ACE) thanks Harlan J. Berk for sponsoring the ACE Traveling Coin Exhibit. The photo shows Harlan J. Berk, numismatic author and scholar with Scott Uhrick, Director of Ancient Coins for Education, at the New York International Numismatic Convention (NYINC) which is the largest coin convention in North America for collectors of Ancient and World coins. The NYINC is held at the Waldorf-Astoria Hotel in New York City. Ancient Coins for Education is pleased to announce the ACE Traveling Museum or the ATM. The ATM was developed through ACE and established with the generosity of Harlan J. Berk. This traveling collection of coins dates from 500 B.C.E. to 1200 A.D. and represents various cultures throughout the Mediterranean Classical Ancient World. 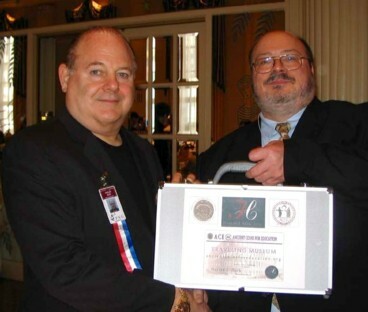 The exhibit was presented to the Ancient Coin Collectors Guild (ACCG) for the first time at the New York International Numismatic Convention on January 12, 2008. ACE has collaborated with the ACCG for several years to bring numismatists and students together in order to promote the study of ancient numismatics. This traveling exhibit includes approximately 100 coins with historical information. St. Louise de Marillac School in Pittsburgh, Pennsylvania will be the first to host the exhibit at the school's Open House on Tuesday, January 29.